The implication that ‘Er Indoors is a tyrant is reinforced by the appearance of the actress Claire Davenport (famous for such roles) as her sister. Arthur’s favourite drink was a large vodka and tonic, which he referred to as a “large V.A.T”, a wordplay on Value Added Tax. …the implication that she is a fierce and formidable woman is reinforced by the appearance of actress Claire Davenport (famous for such roles) as her sister. Arthur’s favourite drink was a large Vodka and tonic, which was referred to as a ‘large V.A.T’, a wordplay on Value Added Tax (The UK tax on sales). Perhaps Martin Chilton, Culture Editor online at the Telegraph wrote the Wikipedia page for Minder. DM Reporter is launching the first annual ‘Don’t Read the Daily Mail’ Day tomorrow. We are thusly forbade on September 24th from reading, linking, tweeting, updating, posting, critiquing, spoofing, complaining, borrowing, commenting or thinking about the Daily Mail. We’ll keep it out of the line of sight of those who have befriended or followed us. We’ll not start sentences “guess what they wrote today,” and we will not bite when Samantha Brick offers us an apple. DM Reporter argues that the Daily Mail “doesn’t care if we love it or hate it, it only cares that we read it” – they don’t care who is clicking on a link or why, they only care that people are clicking. Ignoring the Daily Mail for just one day a year sounds like an easily achievable goal (if you think it’s too easy, perhaps you’d like to pledge to ignore the Mail for a longer period of time) and if there’s a chance it might annoy the Daily Mail even a little bit I think it might be worth a try. Anybody who would like to irritate the Daily Mail but does not wish to ignore it might like to consider other options. You could carry on as you are and continue to point out their factual inaccuracies or instances of their bigotry or hypocrisy (or point and laugh at them, or whatever it is you do). If you have a legitimate complaint about an article, you might like to try complaining to the paper (who will ignore you) or the PCC (who will likely fob you off). Or you could perhaps try something a bit different – like reverse incentives. Maybe you could find a cause that the Mail would hate, and donate to it every time it was criticised by the Mail? I’m sure there will be plenty of other possibilities that haven’t occurred to me too. 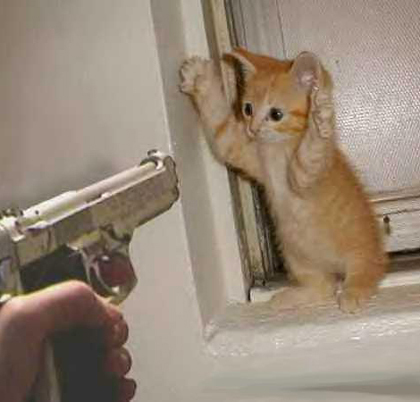 This is what Paul Dacre might see if he were a kitten killer. Which, as far as I know, he isn’t. Of course, Paul Dacre is not really a kitten killer. I’ve made that up. Newspapers such as Dacre’s Daily Mail though, and I’m not making this bit up, are allowed to print pretty much any headline they like. As long as they make clear at some point that the headline is untrue. Perhaps in, say, paragraph 19 of the article. This is problematic. Not everyone will read the whole article. A few will read right to the end, some will look at the pictures and maybe read the first couple of paragraphs. But everyone will have been exposed to the headline. The Poynter Institute found that online participants read an average of 77 percent of story text they chose to read; broadsheet participants read an average of 62 percent of stories they selected; and tabloid participants read an average of 57 percent. They also note that readers described as ‘scanners’ viewed headlines and other page display elements without reading much text. It’s clear that some people might be influenced by a headline without ever reading the attached article.